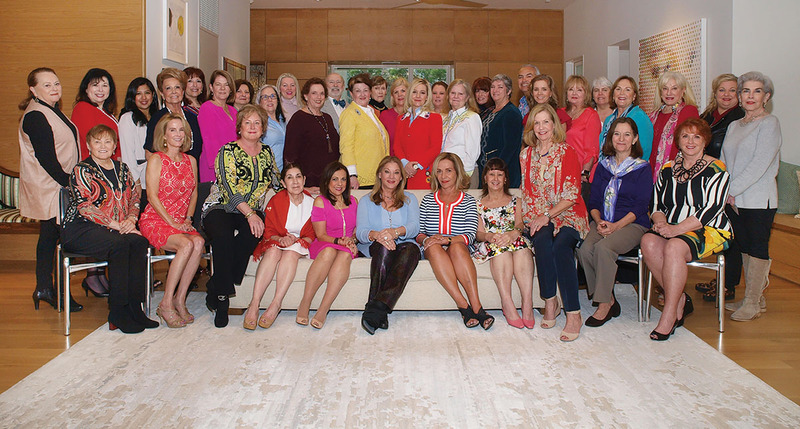 Lenni Burke hosted the Spring Spectacular Committee kickoff in her home. Despite gloomy weather, committee members wore bright spring colors. Pictured are (back row, from left) Kaylon Phillips, Janet Colletto, Daisy Perez, Philamena Baird, Sara Wright Parr, Tracey Williford, Cecilia Campbell, Gay Currie, Gaylon Gullquist, Myrna Fisch, CC Conner, Susan Lehmann, Sharon Erskine, Joan Dunlap, Ann Bean, Casey Rowe, Diane Fitzgerald, Devyn Wolens, Cheryl Zane, Ben Carmona, Mary Alice Parmet, Rhonda Smith, Jennifer Kushner, Eileen Murphy, Tua Burke, Katrina Arnim, Nancy Shomette; (front row, from left) Anne Graubart, Susan Binney, Patsy Chapman, Cynthia Brown, Denise Kay, Wendy Wilkins Burks, Cynthia Christ, Marilyn Ragsdale, Lenni Burke, Jean May and Sam Gershen. The Houston Ballet Nutcracker Market’s inaugural Spring Spectacular is April 12-14 at NRG Center. Like the Nutcracker Market, the Spring Spectacular is a shopping event that raises funds for the Houston Ballet Foundation, its Academy and scholarship programs.